Choreographer Vicki Van Hout, left, the Wagana Dancers and Ian RT Colless from Arts NSW prepare for the NSW Aboriginal Arts & Cultural Strategy presentation at Carriageworks. So who goes to a mid week evening strategy presentation? Plenty of people as it turns out, when it’s the Arts NSW Aboriginal Arts & Cultural Strategy 2015-2018 at Carriageworks last Wednesday. The hors d’oeuvres kept coming and the wine flowed to celebrate the launch of this second-edition strategy. Wiradjuri woman Donna Ingram from Redfern began the formal part of the evening with the Welcome to Country, followed by a performance by the Wangana Dancers under the direction of Jo Clancy and Jacinta Tobin. The Acting Senior Aboriginal Cultural Development Officer Ian RT Colless did a fine job as MC for the evening, introducing in turn Arts NSW Director Mary Darwell and the Acting Manager of Infrastructure Sharni Jones (who as the substantive Senior Aboriginal Cultural Development Officer worked on the strategy, along with others in the Arts NSW team). 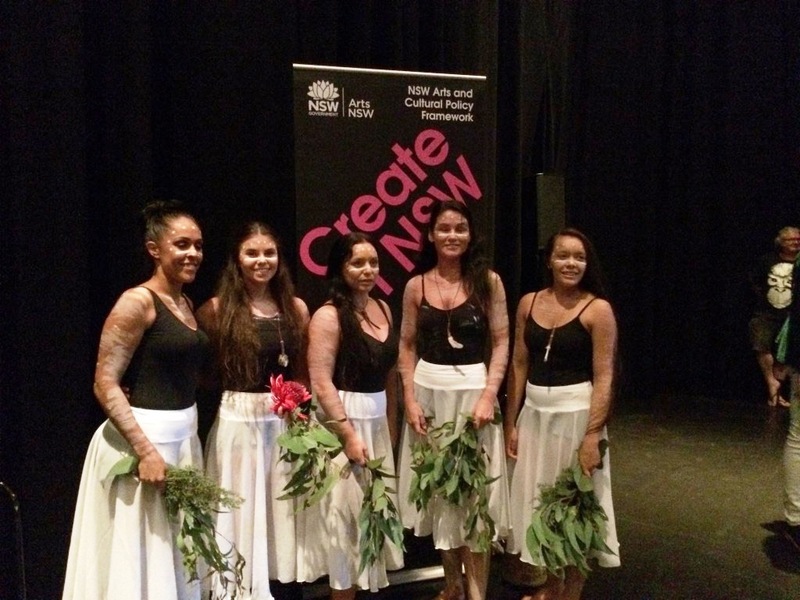 Then it was the turn of the 2014 Arts NSW Dance Fellowship, Wiradjuri woman and NAISDA graduate Vicki Van Hout, the first Aboriginal person to receive the fellowship, to give an inspirational speech about her experiences. It was good to see a few of the longtime Aboriginal arts activists present for the proceedings, including theatre practitioners Lily Shearer and new Sydney Festival Artistic Director Wesley Enoch, curator Djon Mundine, the Australia Council’s Aboriginal and Torres Strait Islander Arts Board’s Executive Director Lydia Miller and Tim Bishop, another NAISDA graduate, now at Bankstown City Council. The new strategy builds on the previous through a three pronged approach of connection, culture and pathways. These strategic themes are underpinned by three strategic directions of market development, careers and government and Industry partnerships.